The British Gold Sovereign is one of the most ubiquitous of all coins and much sought after by both coin collectors and bullion investors. 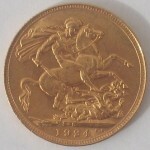 Sovereigns have been minted since 1817 (in Britain 1817-1917,1925 and 1957 on). 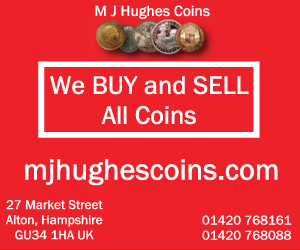 At coins fairs you often hear the dealers refer to these coins as ‘Sovs’. Besides being minted in Britain, Sovereigns have been made in Australia (Melbourne, Sidney, Perth), India (then Bombay, now Mumbai), Canada (Ottowa) and South Africa (Pretoria) although these regional mints have not made sovereigns since 1932. 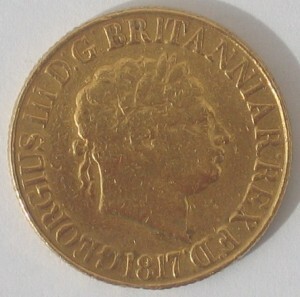 The non-British coins carry a small mintmark (‘S’,’M’,’P’,’I’,’C’ or ‘SA’) just above the date. 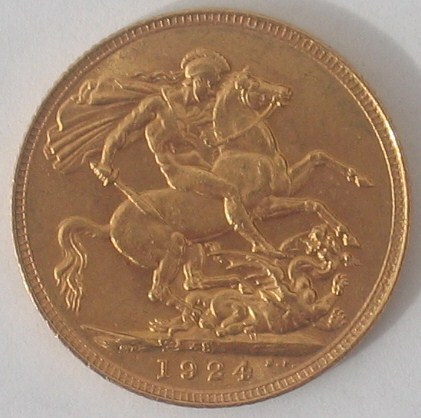 The Obverse is the Monarch’s head and the Reverse is most often St George and the Dragon, although other backs have been used and are of interest to collectors. The Reverse often gives the Sovs a new term, like ‘ShieldBacks’. 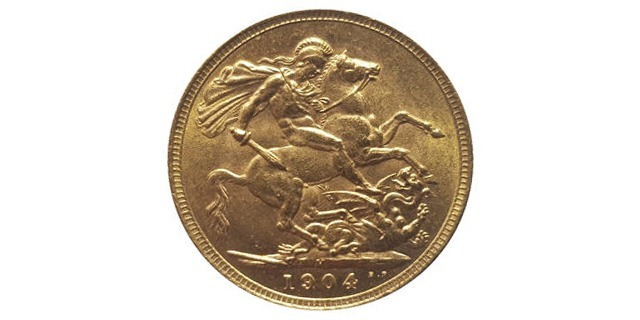 Up until 1604 there was a coin called the English gold sovereign and in 1816 when there was the ‘Great Recoinage’ the name was revived. At that time standard gold (22 carat) was valued at £46 14s 6d per troy pound; this meant a £1 coin needed to weigh 123.2744783 grains or 7.988030269 g. The weight is still the same today. The first sovereigns carried the head of King George III and the famous George and the Dragon design by Benedetto Pistrucci, an Italian engraver who became chief medallist at the Royal Mint. 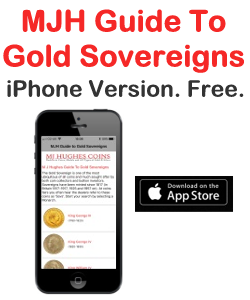 The Gold Sovereign is very popular with collectors. Due to its gold content, the coin has a high intrinsic value making it a good investment too. Collectors can also get some dates as a highly polished ‘Proof’. Half Sovereigns are also common. With high value coins, collectors and bullion investors often worry about forgeries but actually gold coins are very difficult to forge due to gold’s unique properties of density and colour. Gold is the extremely dense and to use another metal and gold-plate it would mean a coin under-weight, over-diameter or half as thick, something that would be spotted very easily. More difficult to spot would be a bullion coin melted down and re-cast as a highly collectable date, but an expert can usually tell these too. You should always use reputable dealers.